Castle Cleaning are pleased to offer the following service to home and business owners alike. Decking is quickly becoming an increasingly popular investment but how best do you maintain this investment. 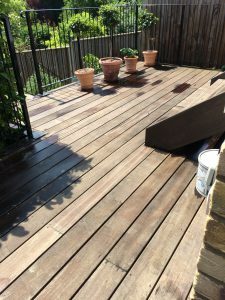 At Castle cleaning we have formulated a tried and tested system for cleaning, maintaining and protecting all types of decking areas. Firstly the decking is coated with a specialized cleaner to treat the Soil, Moss and Algae that has built up over time. The decking is then pressure cleaned with the optimum amount of pressure, so as to not splinter the wood, this is then allowed to dry. Finally we will apply, depending on your tastes, an oil or stain to protect the decking from the elements. With stain protecting different colours can applied to personalize the look of the area.